Andy Warhol’s mural for the 1964 World’s Fair in Queens, New York, before it was destroyed. 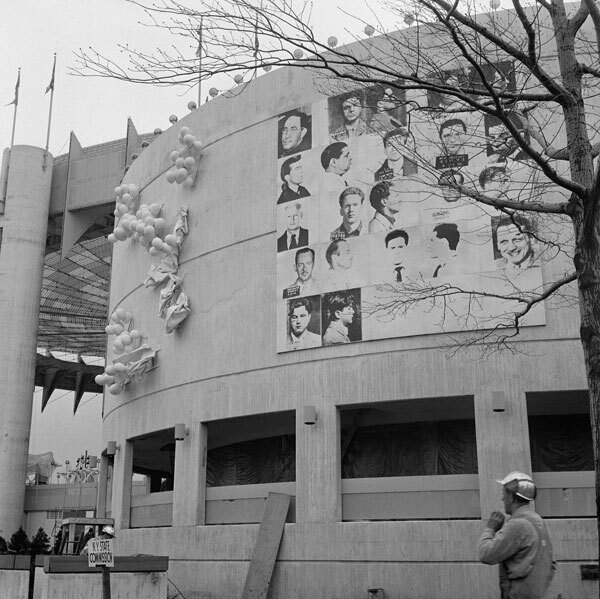 Fifty years ago this month, Andy Warhol installed a grid of controversial screenprints on the side of the New York State Pavilion at the 1964 World’s Fair in Flushing Meadows–Corona Park, Queens. The mural portrayed 13 infamous men whose grainy, black-and-white mug shots Warhol had culled from a 1962 “most wanted” booklet issued by the New York Police Department. However, as soon as the Pop artist posted his “13 Most Wanted Men” on the wall, a scandal erupted among the fair’s organizers. View our Amazing Warhol collection here.